Picasso’s Woman’s Head, given to the Athens National Gallery by the artist himself, was stolen on Monday along with two other valuable works of art. The Picasso painting was given to Greece in 1949 in recognition of the country’s resistance to Nazi Germany. According to police, a Mondrian painting and a sketch by Italian artist Guglielmo Caccia had also been stolen. The heist took place shortly before 05:00 local time and took just seven minutes, police said. The thief or thieves broke into the back of the gallery after forcing open a balcony door. All three artworks were stripped from their frames. A guard was alerted by a burglar alarm and caught sight of the silhouette of a person running from the building. He ran after the thief, who dropped another painting – Mondrian’s Landscape – as he made his escape. Police said the guard had been distracted by several alarms going off at various points in the building earlier in the evening. When he went to investigate, he found no-one in the gallery. The police added that the theft occurred on the final day of an exhibition called Unknown Treasures, which included works by German artist Albrecht Duerer and Rembrandt. 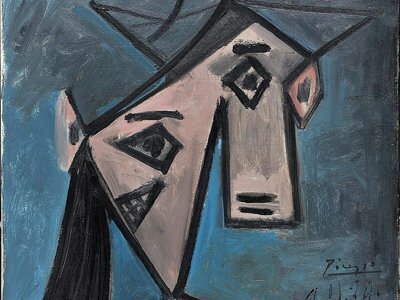 Picasso’s Woman’s Head is a Cubist bust created by the artist in 1939. The Mondrian work dates from 1905 and is an oil painting of a riverside windmill and Caccia’s religious scene of St Diego de Alcala is a pen and ink drawing. Museum officials have not yet determined the worth of the stolen artwork, but closed the gallery on Monday as a result of the break-in. It was already scheduled to close for expansion and refurbishment work following the end of the Unknown Treasures exhibition. The museum has a large permanent collection of post-Byzantine Greek art, as well as a small collection of Renaissance works and some El Greco paintings.